When driving at YQB, Learn how to receive these trip requests and get in on the action. We’ve instituted a special first vehicle in is the first one out (FIFO) system at Québec City Jean Lesage International Airport. The FIFO system only works within the designated, geofenced area and driver-partners waiting elsewhere will not receive trip requests through the Uber driver app. The Uber vehicle decal (trade dress) must always be displayed on the rear passenger window facing outward. Driver-partners can obtain this Uber decal at their local Uber Centre. All trips need to be requested, completed and paid for through the app. Please be respectful of airport property. Uber partners are not allowed to use facilities and areas reserved for taxi and limousines. 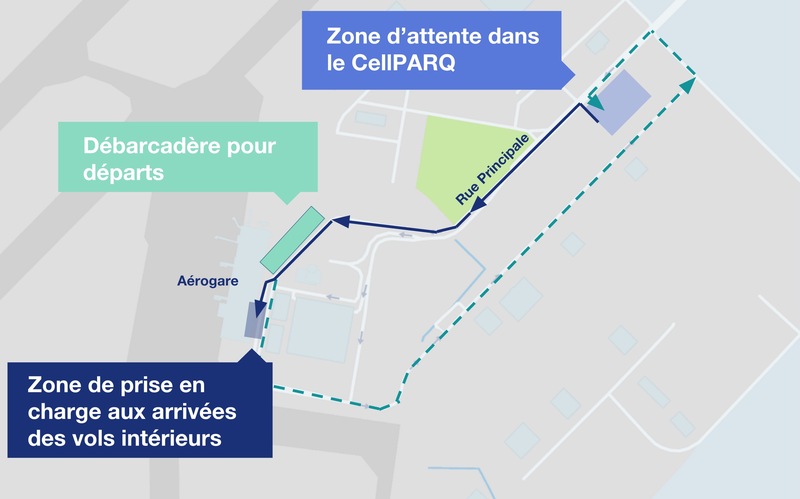 Based on the operating agreement with the airport, the waiting area is located in the CellPARQ lot. (see map below). Once you accept a trip request, the pickup location at the airport is located at the door at domestic flight arrivals, under the footbridge, by columns 13-14. (see map below). Based on the operating agreement with the airport, riders can be dropped off at the public dropoff area. If you’d like to receive a trip request afterward, you’ll need to keep the Uber Driver app on to maintain your place in the FIFO queue. Note that you will only receive airport pickup requests if you are inside the Uber waiting zone. Click here to see enlarged map. Keeping the airport waiting area clean: The rideshare waiting area at YQB is equipped with toilets and trash cans. The facilities at the waiting area is on YQB property and for everyone to use. Being respectful of these facilities and the grounds creates a better environment for everyone. Checking the arrivals schedule: Checking the arrivals schedule at YQB can help you maximize your earnings with information about when flights will be landing at the airport and when it will be the busiest. See YQB arrivals schedule.